If you are looking for something for that hard-to-buy-for person. I have found Uncommon Goods is a great place for some Unique Gift Ideas! I have to tell you that I had a lot of fun picking out a few items for my family. This store is awesome and I kept saying that over and over. I’m excited to share with you! Quick Pop Maker ~ flash-freezing machine makes pops in up to 9 minutes without electricity. I was a really cool mom the day that this machine arrived. 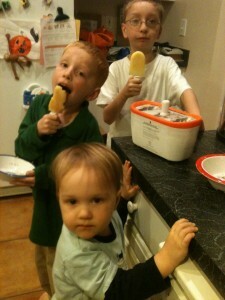 The boys ask to use it all.the.time. How can I say no to healthy snacks?! Healthy AND Fun! Pour in juice, yogurts, even fresh fruit and make your own pops in just minutes. Watch it freeze in front of your eyes. It’s really cooool! Ok Mamas, I know you are looking for some Green Gifts this year too…Uncommon Goods has LOTS of those! Wait to see what I reviewed…you cloth diaper parents are going to want one for sure! Einspine’s Drying Line for indoors! I wish I had this long ago! What makes it so unique is the pulley system! 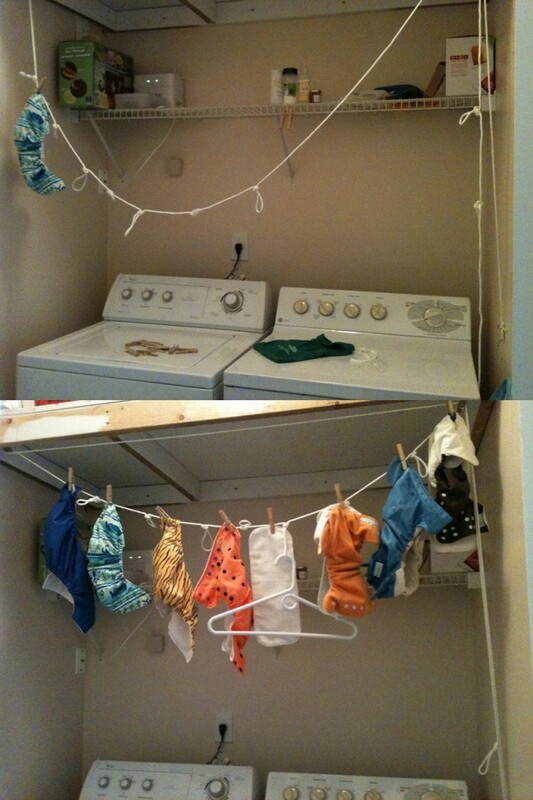 I am short and now I can bring the rope down to my level, attach the diapers (or hook the clothes hangers in the loops) and then yank it back up high ~ wonderful space saver! LOVE!! Peanut Butter & Jelly Spreader~ double ends and spatula-like spreaders reduce the amount of silverware needed to make a PBJ, while eliminating mixing. Have you ever seen anything like this? I knew I had to try it out! We love pb&j at our house. But do you know why I REALLY love this new tool? 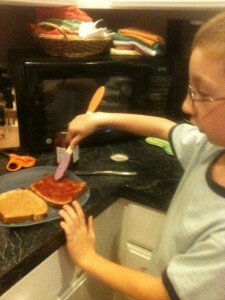 My boys actually want to make their own sandwiches! Long handle and oval tips help to get pesky peanut butter out of the bottom of the jar! Toooo Fuuun! Who on your gift list needs unique gift ideas? I was sent these products for review. I was not compensated in any way and all opinions are my own. Links may be affiliate. My hard to buy person is my dad, i never know what to get him. My hard to buy for person is my husband! my in-laws are hard to buy for. My husband is hard to buy for. Partly because he and I have very different interests: I have no idea which putter he would like. But also because he's a pretty simple guy and just doesn't need or want a lot of stuff. I love that abut him, but it does make gift-giving a challenge. Luckily, I don't really have a hard to buy for person. Mu Husband is very hard to buy for. My hard to buy person is my sister-in-law. Her and her family have everything and whatever they want they buy so it's difficult to find something different and new...which is why Uncommon Goods is perfect! Thanks for the chance to win! My husband is definitely the hardest to buy for and he is never any help! My husband and yes I am, so glad! My husband is the hardest to buy for, I never have any idea what to get him! My hard to buy is my husband. He has everything and buys what he wants, when he wants it! UGH! Thank you. my nephew is my hard to buy for person. He seems to have everything imaginable. My hard to buy for person is my oldest son. He usually just goes & gets what he wants, then we have nothing to get him! Yes, neat store! My grandfather is so hard to buy for. He never wants anything, but Im sure this store has something to make him smile. My hard-to-but for person is Hubs. Did I say "hard to buy for?" I meant dang near impossible! I AM glad to have found this store! My hardest person is my brother-in-law!!! My hard to buy person is my Aunt Shelley! I never know what to get my brother. I'm the hard to buy for person & I love Think Geek. We always get stuff from them. My 16-year old son! Since what he really wants is a car... Not happening, but I saw some great ideas at UnCommon Goods! I have a hard time finding a gift for my husband. I forgot to finish - so... my hard to buy for person is my mom b/c she never wants anything but I think a home item would be good for her! I HATE buying my dad presents. I always find that those relatives that show up at every holiday party but you hardley know are the hardest to shop for. Thanks for finding the site! My 13 y.o. son is very hard to buy for. His interests lie in areas that are very expensive and unfamiliar to me. Computer stuff is #1 on his Christmas list this year... and I don't even know what half of the items listed ARE! My father-in-law... and that Beer Making Kit would be perfect! My Girlfriend! I'm supposed to know her very well, but she's difficult for me to pick out gifts. It's hit or miss every year haha! My mom has to be one of the hardest people to buy for. She never mentions what she wants or anything. My husband is so hard to buy for! He always says he doesn't need anything and just gets whatever he wants when he needs it. I love Uncommon Goods, and have been eyeing the pisa oga espresso mugs for a while now. That would be my mother-in-law. Thanks!! I am the toughest person to buy for. Even when it comes to buying things for myself...I get distracted when I see something that someone else would like....internet shopping ADD! My best friend-she is very picky about everything. My dad is nearly impossible to buy for. He buys everything he wants for himself and doesn't give us any ideas when we ask! Both of my parents are very difficult to buy for! My Father-in-Law is very difficult to buy for! Thanks! my hubby and father in law! My BFF is impossible to buy for. UGH! My hubby is very hard to buy for. I always appreciate sites with good ideas for men. My oldest sister, I just never know and she thinks gift cards lack imagination. My dad is hard to buy for! I feel like all I ever get him is another dvd. My inlaws because they have EVERYTHING! I would love that quick pop maker! How neat! I love their products--always so unique and fun! I'd say my dad is the hardest to buy for... if he doesn't like his gift, he'll let you know. My husband and my mother are impossible to buy for!! My dad of course, and I HAVE used uncommon goods in the past. Love their options for gifts! My father is my hard to buy for person. My hardest to buy for is my father, because he has everything anyway. My husband is the hardest to buy for. my dad is sooo hard to buy for... he doesn't want much and what he needs he buys himself. I would get something here for my brother in law, never know what to get the man. My mom and dad are the hardest to buy for. My dad is hard to buy for. My step-mom is really hard to shop for. my husband is hard to buy for, he doesn't want much or need much. My sister! I was just lamenting about how impossible it is to find a cool gift for her! Glad you featured this store...bet I can find something for her there! That peanut butter and jelly spreader is an awesome idea! My dad doesn't really have any hobbies but sitting around watching TV so it's hard to find things that he doesn't already have that will actually get put to use. my brother is so hard to buy for! My hard to buy for person is my Aunt Brenda! She is soooo tough! My dad is our hard to buy for person on our list! My brother is hard to by for one. My dad but he loves crazy gadgets so this is perfect! My boyfriend is so hard to shop for. He never tells me what he wants. My mom is hard to buy for...but I could find something on this site for her. My dad will love stuff from this site! My father-in-law...it is always the men. I can always find something at Uncommon Goods. My husband is my hard to buy for guy. He doesn't ask for much and what he does want, he goes out and gets... This is a great wite, chocked full of things even he wouldn't be able to "just find". My kids are super easy. What's tough is finding appropriate gifts for the boss and spouse. They never make things easy! My dad is difficult to buy for! My younger daughter is impossible to buy for--if she wants something, she just buys it herself! My Brother IN law is hard to buy for. Hey you!!! Long time no talk. :) My Dad is the hardest person to buy for! He likes corny old TV shows but I think I've bought him every Corny Old TV Show DVD Series out there! My father! He doesn't do anything but tinker with things (sometimes that aren't even broken!). He buys everything for himself, but even if not, I wouldn't know what in the world his gigantic tool shed would need. my husband. simply b/c he buys everything he wants throughout the year as he wants it! yes, i am so glad you found this site! Any adult is hard for me to get things for. I know what to get kids, but have trouble with adults. My husband is hard to buy for! He's great at thinking of things for me, which makes it even worse. My dad -- he is so hard to buy for! My mother-in-law is the hardest to buy for! My dad is sooooo hard to buy for- it is a struggle every year. My husband is hard to buy for. He won't give me any ideas and isn't really into "stuff". My hard to buy for person is my Dad. My father in law is my hard to buy for person. He has few things he enjoys other than watching sports and cooking but he has a tv and all the kitchen gadgets anyone could ever need. I can never figure out what to get him! my dad is always hard to find stuff for. This site has some neat items. My hard to buy person is................me! Cuz, im always last...i dont choose stuff for myself! That would be myself.. Everyone in the family is very easy to shop for! My soon to be 13 year old is going to be the hardest to buy for this year. He hasn't given much to go off of. My mom without a doubt! My hard to buy for person is my brother-in-law...he usually has or get whatever he wants. My little brother. Teenagers are always hard to please. My dad is my hard to buy for person. He seems to have everything already and its hard to find a special gift for him. My husband is hard to shop for. My husband is my hard to buy for person. My father is very hard to shop for! My Dad can be impossible to buy for. He is able to buy the things he needs so I am always on the lookout for something unique. my sis is so hard to buy for! My sister who seems to have everything. My oldest son. He is out of the toy stage and now likes way to expensive electronics. My mother-in-law is my hard-to-shop for person. My parents can be difficult to shop for because it seems like they have everything. My husband is really hard to shop for. My son is my hard to buy for person. I never know what to buy my sister. She is so picky and I want to get just the right thing. *I* am the hard to buy for person so I will definitely be sharing this =) The hubby is hard to buy for too, so this is a fun website. My grandma is super hard to shop for-she has everything she needs and no room for clutter and is diabetic so sweet treats are out too! the hardest person to buy for is my stepdad. he hates the holidays and shows it. he never gets excited or anything and getting a thank you out of him is like pulling teeth. sometimes he even says things like "this isn't really for me because your mom will use it not me." makes me furious! My SO is hard to buy for ãƒ… *Thanks* for the giveaway! oh i love the uncommon goods web site ... I shop there for xmas every year ! I know what to buy for my dad. My hubby is my heard to buy for person, I would be so thankful to win this! happy thanksgiving!! My husband is impossible to by for!! My brother is really hard to buy for. My mother-in-law because she already has everything! My hard to buy for person is my mother in law. The hardest person is my granddaughter's fiance because I just don't know him very well. I really like uncommon goods services. They are always doing great work.